It's time to introduce conflict into your work. Gaijin Male Model, based on an essay I wrote years ago about my experience as a part-time model in Tokyo, is a prime example of conflict-driven business writing. By using conflict throughout Gaijin Male Model, I make the story more interesting than it would have been if I wrote it as a straight narrative. You’ll notice conflict throughout—first with the other models I encounter and, near the end, within myself. 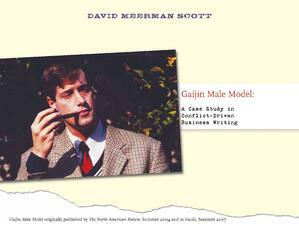 Gaijin Male Model is certainly an example of business writing. But it’s not the sort of business writing that most people are familiar with. The difference is conflict, an important yet overlooked aspect of all good communications. An explanation of how conflict-driven business writing can improve business communications. Multiple examples of how to use conflict in your writing.